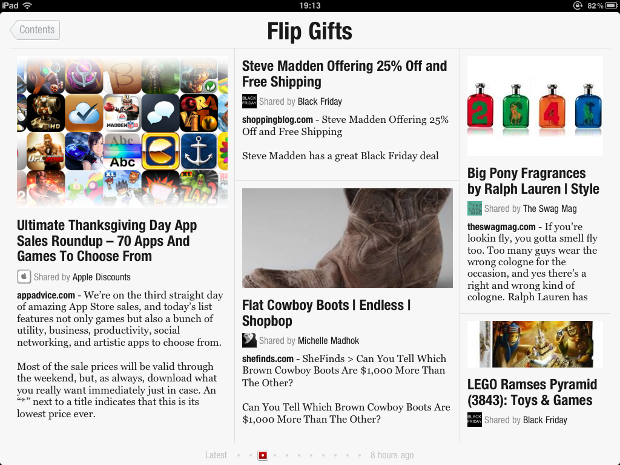 Right in time for Black Friday and with many of its users sitting around on sofas digesting their turkey, iPad news app Flipboard has just announced a new curated section called FlipGifts that allows you to flip through posts, deals, and announcements about holiday shopping. This is a really, really good idea. Why? Well, first of all, as with all of Flipboard, the FlipGifts section recreates the sensation of casually flipping through a magazine, or in this case a shopping catalog. Beyond the curation aspect of it, it’s really the image integration that is super compelling after just flipping through a few pages of FlipGifts. In three flips, we saw images of Blu-Ray players, blenders, watches, a Victoria’s Secret model, cowboy boots, and cologne. That took all of about five seconds to process. One you click on any of the posts you of course see the beginning of the article, but also of course you see the reactions (mostly retweets) in the right hand panel. 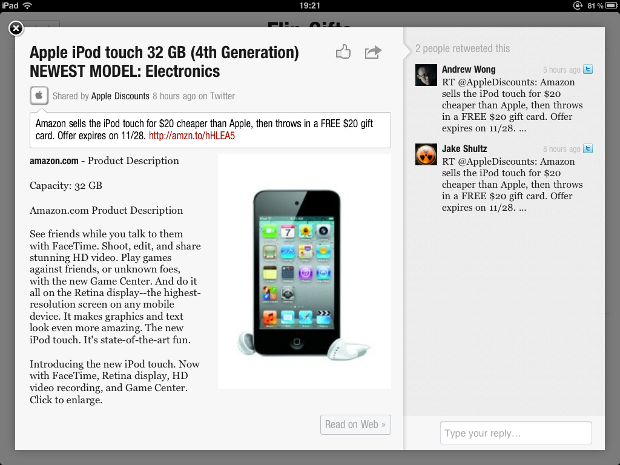 This could turn into a great way to see what people are saying about the deal you’re looking at. 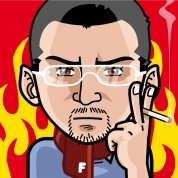 Ok, so that’s about the story right now with FlipGifts, but let’s look into the future a bit. First of all, we can easily imagine retailers lining up at Flipboard’s office to get a custom FlipGifts section built for their stores. Going even further into the future, when tablets are more ubiquitous, we could see people going beyond casually looking at these tablet catalogs at home to even using something like this in-store. Basically, if Flipboard (or someone else perhaps) plays its cards right, it could eventually replace shopping catalogs – that’s got to be a huge market, and one that with some refinement and more partners (the number of sources is a bit limited right now it seems), we see no reason why Flipboard couldn’t go after right now.